Maruti is planning to launch a CNG variant of the Ertiga in another three months’ time according to reports. The Ertiga is currently available with a 1.4 litre petrol engine and 1.3 litre diesel variant. AutocarIndia reports that Maruti is planning to sell about 1,000 to 1,500 units of the Ertiga CNG each month. This vehicle will come with the 1.4 litre K-Series petrol engine adapted to run on CNG. The engine in petrol guise puts out 94 bhp of power and 130 Nm of torque, but expect to lose about 15% power on CNG. Given the pent-up demand for the Ertiga and the limited capacity Maruti has because of diesel engine demand from the Dzire, Swift and Ritz as well besides the slow-selling SX4, which share the 1.3 litre engine with the Ertiga, a CNG variant would provide buyers with a mid-price variant, slightly higher than petrol, but cheaper than diesel and would appeal to those looking for a people mover in the city. Also read: LPG vs. CNG – which is better? If the Maruti Ertiga does come out in a CNG variant, it would be the first compact MPV with a CNG fuel option, and would be a hit with commercial cab operators, who have been eyeing this possibility. The only limitation would be how Maruti plans to store a CNG cylinder in the Ertiga, as there is very little useable boot space when the third row of seats is in place, unless it plans to sell it only as a five-seater with CNG, like it has done with the Maruti Eeco. However, if you were looking for a Maruti Dzire or a Maruti Swift with factory fitted CNG, you will need to wait much longer as Maruti hasn’t indicated any plans to introduce CNG variants of either of these popular cars owing to pent up demand and steady sales for these cars. 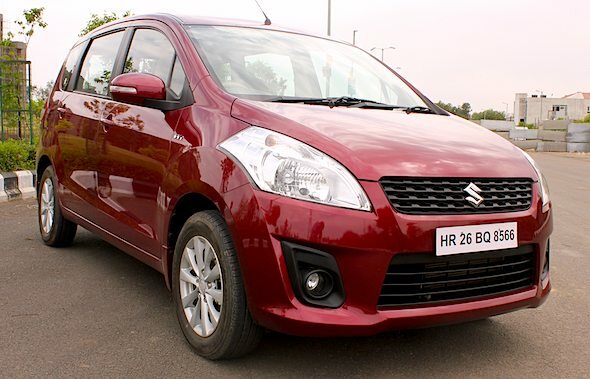 Together the Swift and Dzire account for over 35,000 cars a month. Nearly 80% of all Swifts and Dzires sold are in diesel now, but in the past month that has slipped a bit to about 70%, showing a comeback for petrol. If Maruti does launch an Ertiga with CNG (and it may launch it only on the mid-variant VXI trim), would you buy it?